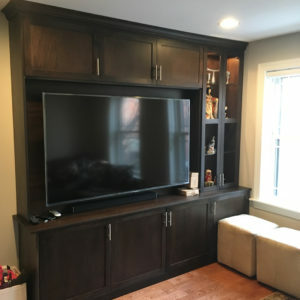 Are Wall Units Outdated? Not When They Look Like This. When we help our clients redesign their living rooms, it’s our job to make sure they get their money’s worth. Since design trends can come and go so quickly, we wanted to discuss one of the questions we get every so often: Are wall units outdated? People have long since said goodbye to bulky TVs and DVD storage; is it time to say goodbye to wall units too? 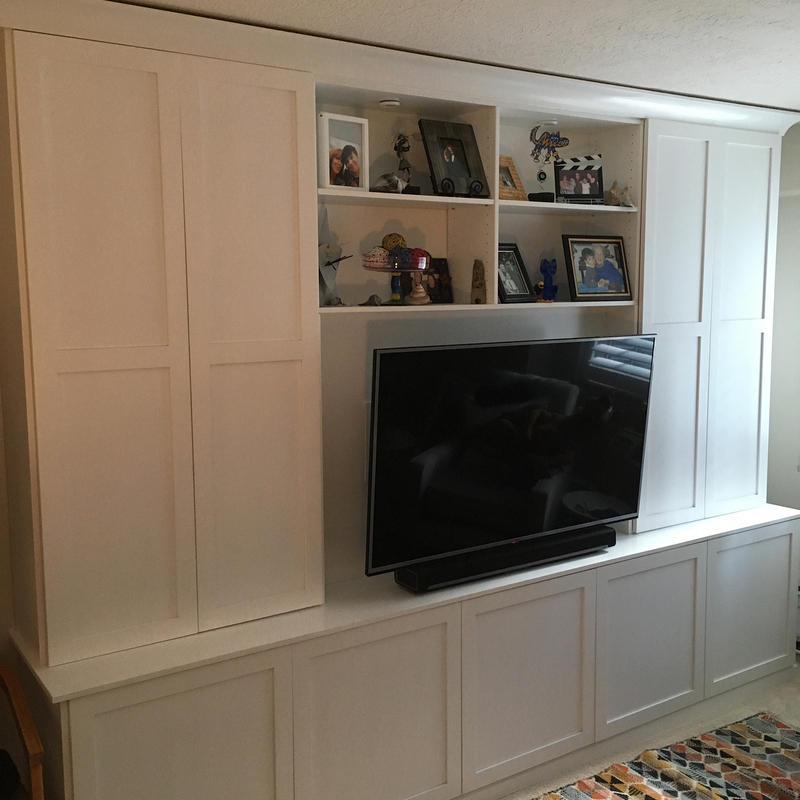 While modular systems may be a thing of the past, a custom designed and expertly built wall unit is always in style. Take a look at some of our recent designs and see for yourself! This gorgeous dark maple wood fits snugly into this Philadelphia home and shows that you don’t need a ton of space to have a great place to kick back and relax. Sleek cabinet handles add an extra modern touch. Check out our portfolio for more examples. 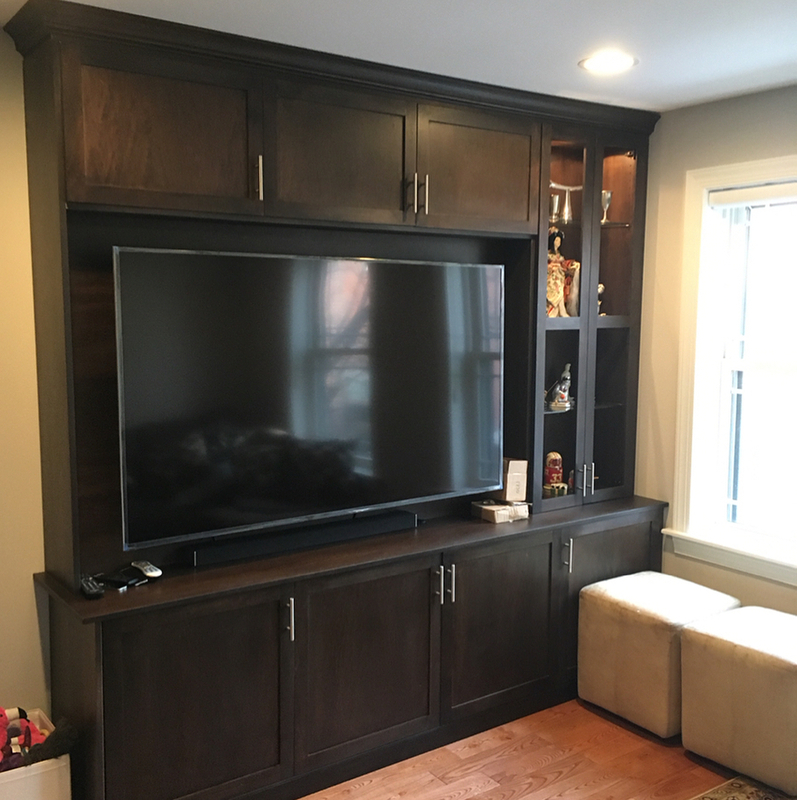 In this Center City high rise, we’ve added lots of storage by adding closets on each side of the mounted television. Omitting hardware and adding trim helps this bright white built-in blend in perfectly. A television mounted over a fireplace is a more traditional take on built-ins and may be what you’ve pictured when wondering, “Are wall units outdated?” But, as you can see in the example above, some styles are just timeless. 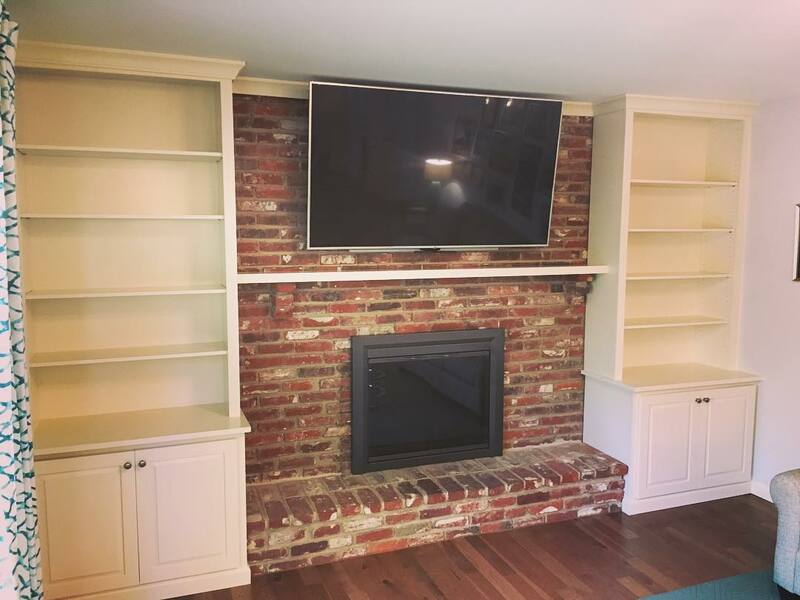 We added built-in cabinets to both sides of the brick fireplace to better anchor the focal point. In keeping with this home’s traditional style, the brick remains red and the cabinets have been painted a classic off-white color. This project is another Philly favorite. This Graduate Hospital home has a narrow footprint and our client wanted to make every square foot count. 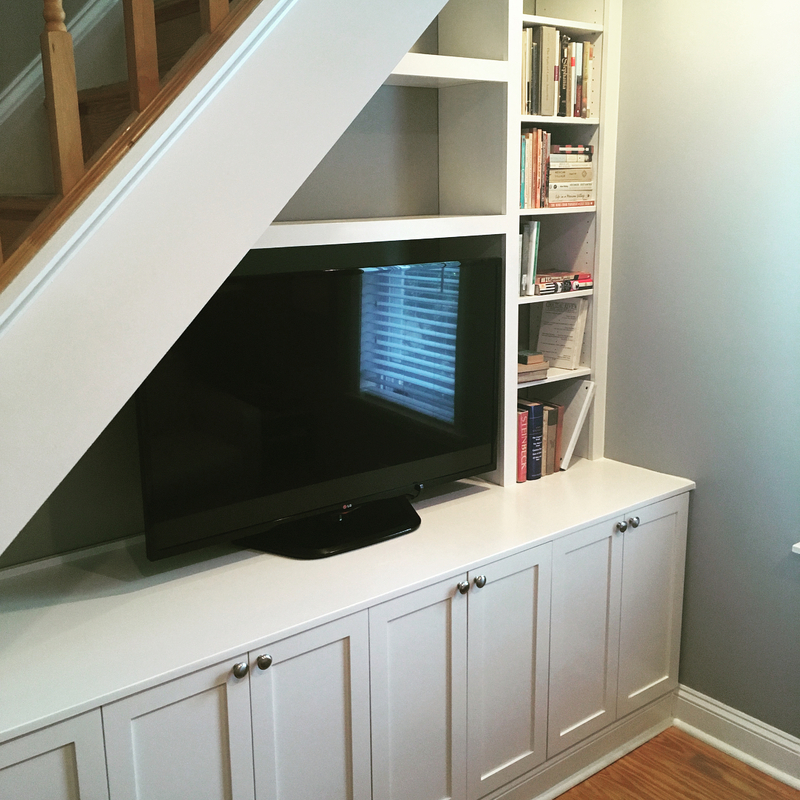 We designed an under-the-stairs built-in wall unit that provides a fantastic space to binge-watch their favorite shows and store their favorite books. Spend your renovation dollars on something that lasts. 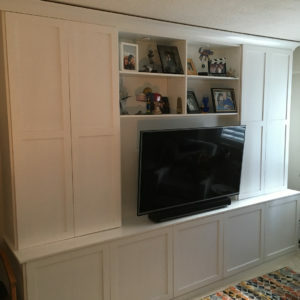 Custom built furniture that’s designed just for your space is guaranteed to stand the test of time. If you’d like a complimentary consultation or learn more about us, give us a call at 215-839-6659. And, don’t forget to check us out on Instagram and Houzz to see our latest projects! Previous post: Which Custom Bookshelf with Desk Built-In is Right for You?